When your cruise ship docks in Amsterdam, set off from port with your very own guide to discover the city like a local. On this private, 4-hour shore excursion, you'll explore Albert Cuyp street market, the Museum District and the Jordaan district, whose jumbled streets are laced with cafes, galleries and quirky shops. Learn about life in the liberal capital; try a typical Dutch snack in Leidseplein and visit the Houseboat Museum to learn about the city’s houseboat culture. questions or photos!!. Ample time for viewing and food. We enjoyed mingling with the locals the whole time too. Loved this tour. Our guide was great. She loves her city and it really came across. This tour was outstanding. Lia our tour guide was fantastic. She was very informative. 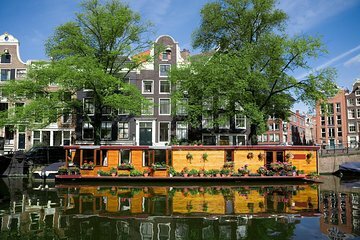 Great guide to have if you have never been to Amsterdam. Really enjoyed this tour of City. Flower market was breath taking in it's beauty. Max was a fun and experienced guide.